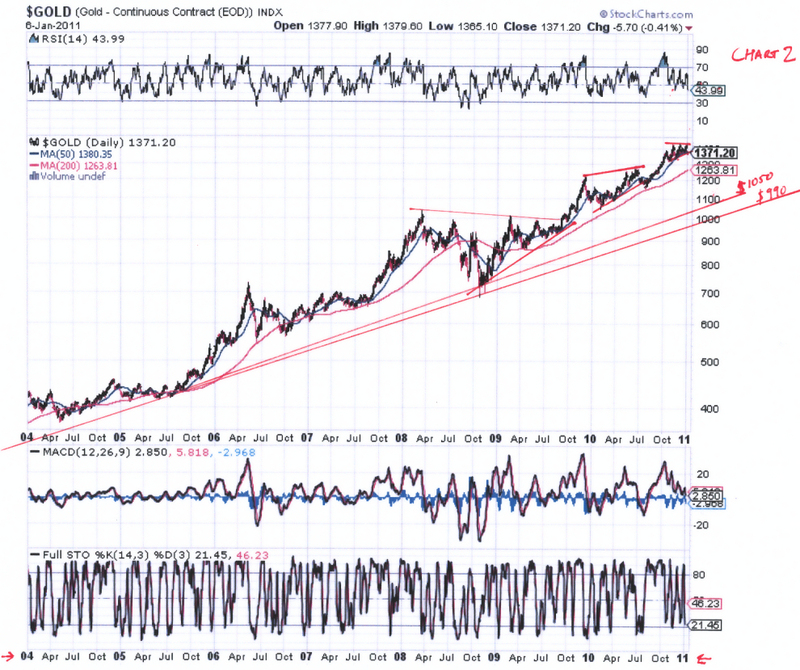 Moneta Musings: Where Precious Metals Investors Fear to Tread…. What a difference a few days make. Just before the end of last year and into this current year, precious metals investors were riding high with visions of ever higher prices in their heads. Today all I read about is the correction in the metals and the anxiety people have over the potential plummet in the precious metals. Let me remind everyone whose eye balls gander across my writings that the last major plunge we had in the PM (Precious Metal) complex was a direct result of “Lehman” catastrophe. Corrections in the PM complex and shares are not unusual and the current one feels “manufactured” to me. The idea that a single data point can cause a plummet just goes to show you that PM’s are not in mania phase at least not yet, especially when the data point does not really point to a new trend. Think back dear reader to the last two manias, the NASDAQ Dot Com bubble and the real estate mess and then look at the PM complex. During the prior two bubbles there was plenty of public participation and no matter what then news it was virtually ignored until the end of said bubbles. Stocks and real estate in those two bubbles rose on their own volition regardless of the negative headwinds reported. The PM’s do not have wide public or even industry participation since as a percent of assets world wide the only represent under 1% and every little rumor about an impending recovery(that never comes) causes longs to bail. Flash forward to January 2011, a lone questionable jobs report is released by ADP and suddenly we have sunny skies for the rest of the century and no longer need and PM’s. The result of what I would consider to be that bogus information is a sell off by what appears to be those interested in driving the price down to force weak handed small fries to dump shares and hop on to the next hot thing as well as jamming all the “hedggies” and black box poachers so their algorithm driven models puke up their shares via either stops or program driven responses. As I look at the charts I see that we are in corrective mode easily within the context of a bull market. I will also tell you dear reader that I made a couple purchases today and I intend to buy more if the price of the PMs (and shares) does fall. I have put up a couple charts for some perspective. 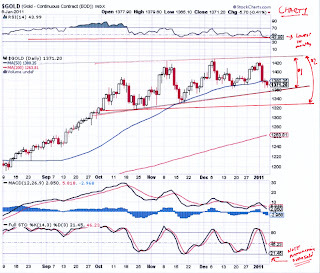 I have seen many technical analysis charts of gold showing bear wedges and calls to fall to $1,260 and I do not subscribe to those views, not that they are impossible but I think there is a 25% chance especially in light of the jobs report and what it portends. I would say that there is a 75% chance that we stay above $1,350 on gold. As far as technical analysis or TA goes I believe that it can be an effective tool, but in this manipulated news driven market TA is less accurate in my book. It is also true that the more eyeballs view the same charts and apply the same patterns and indicators the less relevant they become sort of a TA version of ”buy the rumor and sell the news”. Moreover, while I use TA it is more art than science as every chart is subject to interpretation by the analyst. The analyst chooses the timeframe, how and where to draw various lines and whether consciously or not can input their own bias based upon the decisions made in interpreting the chart. So with the disclaimer above I want to look at a couple charts of gold, now bear in mind that the charts are end of day so these are from last night. I have viewed a chart similar to my chart one on the internet and the TA individual was calling for a bearish wedge and downside to the $1,260. I have created a chart using the same time perspective as the one I viewed and as I stated before depending on how you draw the lines you can come to different conclusions. For a trend line you need at least two points of contact and the longer the trend line the more substantial the trend. The analyst calling for $1,260 was using a bottom trend line similar to the pattern on labeled #1 on the first chart, although their top line was more slanted down as they cut through the candles. The drawing of trend line #2 is not as strong from the perspective that it only intersects with three near points but speaking to that the dips have not tested it either, but they have tested #1. Any way you slice it in my interpretation there is somewhat of a bearish wedge that would take longer to form, but a close below the 1360/1359 line would lead to a test of the 1,340 – 1,330 level. Also note that the chart is showing a pretty good oversold condition as of last night and with today’s action we may see it begin to level off in the oversold zone. To give you real perspective you need to look at chart #2 which extends from 2004 to present. For starters depending on how you draw the long term trend lines gold could fall to $1,050 or possibly $990 without compromising the bull market. Look at what happened in 08/09 and that did not kill the bull since the same macro economic factors are with us today and perhaps they are worse there is no reason to believe that the bull is dead. If you look at the chart you can plainly see that we have had bearish wedges before and bull would correct, dust itself off and continue. There is no reason to believe this time will be different. As an additional note the Gold Miners bullish percent index stood at 63.33 last night which is down from 90% bullish to the same level it was just post “B52 Ben’s” Jackson Hole speech where gave the famous “we need ‘flation” speech setting the QE 2 stage. If we do get a sell off to the $1,260 level it would represent a hell of a buying opportunity. The question is would you be able to get in there and buy or would you feel that there is more downside coming. If I were to venture a guess most people would not buy but instead wait until things were going up. This particular bull market has tried the patience of all involved and has required a cast iron stomach to handle the swings especially in the mining shares. For the last few months the bull in the metal has been a pretty orderly upward grind especially compared to the NASDAQ bubble where it would jump around wildly especially in 1999/2000. The steady uptrend in the PMs has not afforded people the opportunity to buy on too many dips until now. As far as I am concerned it makes no difference if you buy now or wait for a further dip because after this correction all the catalysts are still in place to provide the fuel to drive PM’s higher. Whether you buy now orin a couple months this correction will be a memory and you will be much happier. The PM’s correct every year and every year I go through the same mental games myself, but I force myself to buy. Thus far buying the corrections has worked well for me. Right now the onus is on the bulls to drive the price back and fend off the bear raid that has inflicted damage on the charts. Assuming that gold continues to close above $1,365 it bodes well for the correction being in the latter stages. After all nothing has changed in the macro and there is more bad news on the horizon. Today Portugal’s bond yields hit record highs indicating that they will need a bailout shortly especially if the powers that be want to quarantine the contagion as not to infect Spain, which would open up another can of worms. I don’t care how elites and media spin it the problems the world face have not gone away and will keep cropping up their ugly heads all around the world. All currencies are suspect, at some point people will not want to hold any government’s or state’s debt and it does appear that we are headed for some sort of a crisis. As far as a crisis goes it will probably be something no one thinks that will be the domino to set things in motion. I am sure that people prior to the start of WWI did not think that the murder of Archduke Ferdinand would lead to such a wide and devastating conflict. There is also much talk about cycles and how the PMs are currently in a down cycle that is due to “bottom” in a couple weeks. I don’t buy the cycles argument particularly not in the current manipulated environment, which I have said before would have made Joseph Goebbels stand up and take notice. When I say manipulated dear reader I mean not only is the tape being painted but also the Street, media and the FEDs are in cahoots using MOPE, which is becoming less effective each time the economy stumbles. MOPE is utilized to move the economic levers to try and resuscitate the economy. Based on what passes for both statistics and reporting on them you can almost picture “B52 Ben” standing by the side of a gurney, upon which the economic system lies, and he is holding a pair of defibrillator paddles while frantically yelling “CLEAR…CLEAR”. The latest MOPE was the ADP report which appeared very suspect to me when it was released and it sure aided certain players in various markets. The PM complex did not take to well to the ADP report as if this one data point meant the end of the bull market. Then yesterday Gallup reported that underemployment was up at 19% yet the markets never questioned the validity of the ADP report that painted a much rosier picture. So this morning the markets were looking up and the PM complex was staring down the edge of the cliff diving ledge looking at the rocks below. As I waited watching CNBC this morning(only because they report the numbers the fastest) things were getting gloomier by the second just like when you are out for a run and the sky turns ominously black within minutes yet you are 3 miles from home. The report came out and it showed a headline number indicating a drop in the unemployment rate from 9.6% to 9.4 percent but the jobs created figure came in well below all of the “bubble heads” projections. The futures gyrated all over the place while the PMs firmed up. What was not really discussed in the media was the anomaly that the U-6 report fell pretty sharply from 17% to 16.7%. The fact that this number fell and the U-3 number fell while far less than expected. However, the number of jobs were created indicates to me two possibilities. First, the numbers are bogus and statistical seasonality adjustments are obscuring the reality of the situation. Second, the decline in both numbers is indicative of many people just falling off the roles and are now unemployed and not in the system. Any way you slice it the report was discouraging and who could make any sense of what is going on since ADP, Gallup and the BLS are all saying different contradictory things. Asked about December's 103,000 job gains, Bernanke said if the pace of hiring doesn't increase, "we're not going to see sustained declines in the unemployment rate." Yet he believes the economy will be stronger and consumer spending will be up, I want some of what he is smoking. B52 Ben’s statements do not jive well with December retail sales figures that came out today. The more they talk and MOPE the more apparent it is either the FED is clueless or they are obfuscating the truth to kick the can down the road. “Sen. Jeff Sessions of Alabama, the highest ranking Republican on the committee and a fiscal conservative, expressed concern that the Fed's bond-buying program could spur inflation. And he wondered whether the Fed was simply printing money to cover the nation's deficits. Bernanke countered that the program won't expand the amount of money in circulation in a significant way because banks aren't lending the money.” Well Benny there you have part of your problem is you are printing the money, oh I forgot you are not but instead the Bureau of Engraving is. None the less the banks are not lending so therefore the economy is strained. Once the banks do lend it will be a torrent of inflation to be added to the inflationary capacitors storing dollars around the world waiting to come home to roost. Then Benny was asked about bailing out municipalities to which he responded “that would be up to congress”. Way to pass the buck there “B52”. So we now know that congress is concerned about municipalities. I take this as a warning that something is coming because congress is slow to react to everything and the fact that the question was raised means that they were briefed of some potential near term issue. The debates for those bailouts should be interesting to say the least. So you see folks, Benny and the Jets acknowledge that there are severe problems yet when it comes to solutions the FED always seem to paint everything in a win-win light for themselves. You see it doesn’t matter what is happening they never get called to the carpet. Did they not tell us the QE and QE2 were to lower interest rates and spur the economy to meet the mandate of full employment. While it is clear that the best laid plans of Ben and the FED are being tried they are not achieving the desired results. Wait and see dear reader, this will be a justification for expanding QE 2 or a whole new round of QE 3. Just like Einstien’s definition of insanity they will go with what has been tried before expecting different results that will never come. You have to understand if QE works then the FED is the hero and if QE doesn’t work then they just say we need more. It is no different than their flawed exit strategy because according to the FED no matter what happens in the markets they will be able to mop up the stimulus since the rules of economics don’t apply in the FED universe. “B52 Ben’s” testimony in front of the Senate combined with latest in a series of poor jobs reports tells me that it will be “QE to infinity and beyond”. Yeah I stole that from Buzz Lightyear. The problems and policies namely QE of all flavors here and in Euro land are all supportive for the PM’s. We have yet to see what kind of proposals the new congress can come up with that will have unintended consequences so stay tuned. Whatever they do it will have to be politically palatable so don’t count on anything that affects the underlying problems or the foundation of the PM bull. The take away for all of this is that the best way to preserve you purchasing power is through precious metals longer term. One should look at these bouts of stupidity induced selling as an opportunity to be able to get more precious metals to enhance your future savings. In other words, buying when the price is artificially driven down compensates you for the fact that the metal does not pay interest while preserving your purchasing power. So far Gold is holding at about $1,370 going in to the home stretch this afternoon. I am a bit concerned about the red headed step child silver as it is trading a little below $29, which could lead to lower prices. If gold holds the downside should be contained in both metals. I am not ringing the bell here but we may be getting close given the huge rise in pessimism I am seeing, Monday should be interesting. Will you be fearful to tread in this PM market?